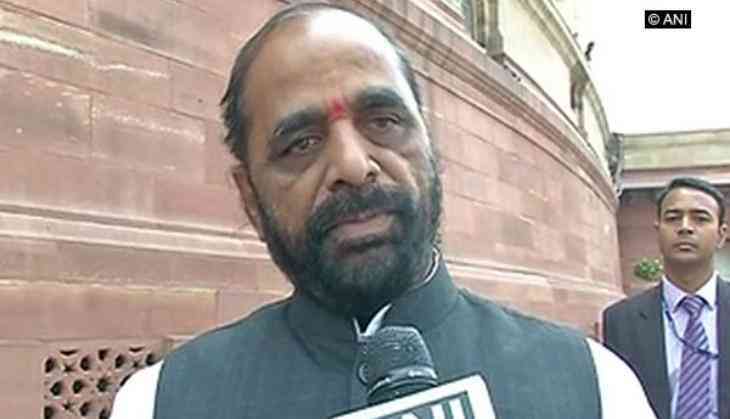 Lauding the crackdown by the National Investigation Agency (NIA) on Separatists that led to the arrest of seven leaders on money laundering charges to fund terror in the Kashmir Valley, Minister of State for Home Affairs Hansraj Ahir on Tuesday said the government is working towards ending terrorism and Separatists from its roots. Ahir told ANI that the NIA will keep doing such work to fight terrorism and no one will stop them. "In Kashmir, the separatists and terrorists have created tensions and the government is working on ending it. NIA is investigating against those who have given a boost to terrorism. We have to show Separatists their real place and end the terrorism. We have to protect people and give security to people. NIA will keep doing its work and no one will stop them. We are working toward success and we will end the terrorism and eliminate all elements of Separatism," he added. The arrested Hurriyat leaders were brought to the headquarters of the Central Bureau of Investigation (CBI) in Delhi yesterday. All the seven of them will be produced before the Patiala House Court today. The seven separatists include Naeem Khan, Bitta Karate, Altaf Funtus, Ayaz Akbar, T. Saifullah, Meraz Kalwal and Saheed Ul Islam. The NIA visited Srinagar in May to probe the alleged funding by Pakistan for illegal activities in Kashmir and questioned several separatist leaders on the issue of raising, collecting and transferring funds via the Hawala route and other channels to fund terror activities in Kashmir. NIA sleuths specifically questioned separatist leaders Farooq Ahmed Dar alias Bitta Karate and Gazi Javed Baba at that time.